The Omohundro Institute and the William & Mary Lemon Project: A Journey of Reconciliation are pleased to welcome Vineeta Singh for a two-year postdoctoral fellowship, to begin July 1, 2018, in the history of institutions and economies of oppression with a preference for higher education and slavery. The OI-W&M Lemon Project Postdoctoral Fellowship is supported by the Ronald Hoffman Fund in Honor of the OI’s Director Emeritus. 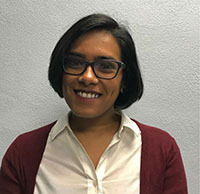 As OI-W&M Lemon Project Fellow, Ms. Singh will devote most of her time to research and writing, and will also work closely with the OI and Lemon Project staffs and participate in colloquia and other scholarly activities of the OI and W&M. She will develop and teach one course per year on the subject of her research as well as hone her digital humanities skills and contribute to the intellectual life of the Lemon Project through the Project’s Omeka site and university website. The Omohundro Institute is a leading research organization for the study of early America, broadly conceived. The publisher of books and the William & Mary Quarterly, the OI hosts conferences, seminars and other events and sponsors a range of predoctoral and postdoctoral fellowships. Founded in 1693, the College of William & Mary has been an important political and social force, both reflecting and giving shape to ideas of freedom, slavery, race, equality, and citizenship in Virginia and the nation. While William & Mary’s role in the nation’s founding has been widely studied, its study of the College’s role in perpetuating slavery and racial discrimination is relatively recent. In 2009 W&M’s Board established The Lemon Project: A Journey of Reconciliation, a multifaceted and dynamic attempt to rectify wrongs perpetrated against African Americans by the College through action or inaction. An ongoing endeavor, this program focuses on contributing to and encouraging scholarship on the 324-year relationship between African Americans and the College, and building bridges between the College and Williamsburg and Greater Tidewater area. The Lemon Project is named for Lemon, a man who was once enslaved by William & Mary.